America’s Next Drag Superstar Takes New York City by Monsoon in “The Vaudevillians”! 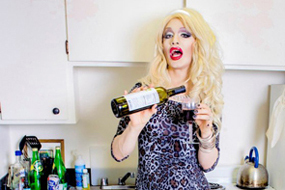 Just where did Jinkx Monsoon come from? 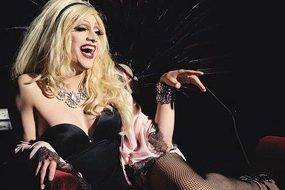 Put most simply, Jinkx is the unique creation of 25-year old performer Jerick Hoffer from Portland, Oregon. But the road to becoming America’s newest drag darling was much more complex. Jinkx Monsoon, as his creator has stated, is “all about contrasts”: sophisticated yet street-smart, classy yet sassy, and showing great reverence for the American celebrity icons of decades past while providing a new cutting-edge sensibility as we approach 2014. 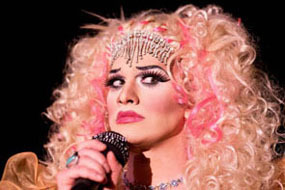 The Jinkx persona was inspired by a multitude of real-life and pop culture characters, starting off with the name. “Monsoon”, as you may have guessed, is an homage to deliciously decadent gay icon Edina Monsoon from “Absolutely Fabulous”. The star’s other inspirations include such funny girls as Lucille Ball, Maria Bamford, Deven Green, and Sarah Silverman; the larger-than-life Disney villianesses; and… Hoffer’s own mother. America’s sweetheart took the time in between shows to talk about the making of Jinkx Monsoon, New York City, “RuPaul’s Drag Race”, and … why you should rush out and see “The Vaudevillians”! JR: Hi Jinkx! So, first off, congratulations for all the praises for “The Vaudevillians”. What’s been the most rewarding moment of the run of the show so far? JM: I think the most rewarding moments have been when we’ve had the chance to perform for some of our favorite artists and entertainers. It’s intimidating, but exhilarating to perform for your idols, and meeting them and knowing they saw your work… That has been truly surreal, and very exciting. JR: No doubt! How has New York City been treating you? Have you found a new favorite hangout spot? JM: It’s been great. A bit overwhelming at first, but awesome. We haven’t had much time to find our favorite “hangouts”, but we had dinner at Beauty and Essex, which was one of my favorite restaurants I’ve ever been to. We also spend a fair amount of time at the Chipotle around the corner from our place. JR: Bumping into Jinkx Monsoon at Chipotle… Now THAT would make my day! In interviews, you’ve spoken about some of your own icons who have inspired your Jinkx persona: Lucille Ball, Marilyn Monroe, the Disney villianesses, and… your own mother. Are there any famous (or infamous) personalities who you’d ever like to portray– or pay homage to– in a future performance piece? JR: That would be fun! So, drag has really come a long way from when it was almost always about lip-synching and mimicking a larger-than-life female gay icon (Not that there’s anything wrong with that!). “RuPaul’s Drag Race” has played a huge role in raising the visibility of the “new” drag. What direction do you see the art of drag moving to as we head towards 2014? JM: Well, I believe that the kind of drag RuPaul’s Drag Race is exposing audiences to (live performance, comedy, character portrayal… etc) has always been around. It just kinda fell out of the mainstream of drag. What I do as a drag queen is not new. My drag idols, like Varla Jean Merman, Lady Bunny, Coco Peru, Joey Arias, RuPaul, Peaches Christ, Jackie Beat, Craig Russell… All of these ladies have been doing live singing, comedy, and characterizations for as long as I’ve been alive, and they inspired me to take that track with my drag. But RuPaul’s drag race IS doing something special, by exposing the artist behind the queen. Letting us get to know the real people who create these drag personas… Making celebrities out of drag queens. Nowadays, there is no limit to what we, as queens, can do. Ru girls appear on TV shows, release top charting albums, have all kinds of merchandise franchises, they even have sold out Off-Broadway shows. Ru has blown the door wide open for us to accomplish our goals and live out our dreams in a way I don’t think was possible before Drag Race. By exposing the many talents and multifaceted nature of these talented queens, our community is embracing drag with a whole new open mind and respect. I love it. JR: That makes two of us! Lastly, why should everyone who’s reading this interview drop their cocktail (or remote control, or whatever…) and buy tickets to see “The Vaudevillians”? JM: The Vaudevillians has everything that a modern audience is looking for in a show. A new, fresh concept, a hilarious conceit, well rehearsed, professionally executed songs, pop culture references, and a little bit of heart and human emotion. It’s a very easy show to watch; you order a cocktail, maybe some pasta or some French fries, and just let the show take you by surprise. But I think what makes it the most exciting for some audience members is that both Major Scales (the co-creator and the music director for this show) and myself really love doing this show. It’s been our dream for years now to perform this show in New York, and here we are. So I think our passion rings clear throughout the show and audiences pick up on that. JR: Sorry, I have to add one more! Inquiring minds want to know: Is there anyone, shall we say, “special” in your life right now?! JM: There is some one I miss terribly… But life on the road only allows for so much one on one time. It’s best just to keep things on a simmer. But they know who they are, and they know I can’t wait to see them again. 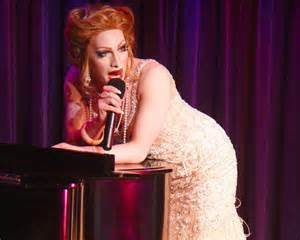 You can visit Jinkx Monsoon’s official website at www.JinkxMonsoon.com. “The Vaudevillians” runs through October 29th at NYC’s Laurie Beechman Theater407 W 42nd St. in Hell’s Kitchen. Buy your tickets to “The Vaudevillians” at www.TheOfficialVaudevillians.com. Next THIS COULD GET HAIRY! Meet BearScots, the Bears of Scotland!